Put a steel pin or a small aluminium disk gently on the surface of water and it will make a slight dent but it will stay there. It will not sink, even though both aluminium and steel have a lot higher density than water. This demonstrates the toughness of any normal water surface, where water molecules are interlocked by cohesion. This water surface tension does not allow oxygen to penetrate much beyond it and it is this that makes aeration of water difficult and it’s energy consumption intense. There are a number of products on the market that get oxygen into water. A common, simple, low energy and very cheap method is osmosis using a flat surface over which a thin layer of water flows. However, this requires large amounts of space and most other aeration methods use huge amounts of energy to get a handful of oxygen molecules into a million water molecules. This not only appears outright flawed it is! The flaws sit at the basic approach in technology. Conceptually, current aeration methods are self-limiting in terms of maximum performance and energy consumption. 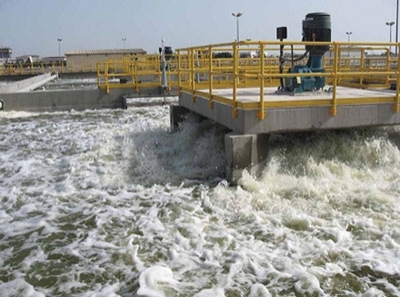 50 – 60 percent of a sewerage treatment plant’s total running cost is due to the electricity expended for aeration. From this perspective alone, the room for improvement is vast. The current limits in aeration technology are comparable to the situation in the aircraft industry, where designs in the 1930s reached their limits due to propeller efficiency and the speed of sound in air. Aeration technology is overdue for a total rethink and a technological change towards Aeration Turbines. A few years of dedicated research can bring about truly fresh results. The first ones are usually the unpleasant ones, where one finds out how things are not going to work. Aeration is a case where ‘state of the art’ is actually the wrong way to go. This may seem to be a very bold statement but after a quick look at further underlying facts and parallels in the past, you will, no doubt, be convinced. Oxygen Levels are measured in ppm (parts per million) and water, depending on temperature and pressure, can only hold a maximum of 6 to 8ppm which is the natural threshold in most common situations. The minimum level is 2 to 4 ppm. Below this, water cannot fulfil any of the roles it plays as a core part of nature. Oxygen Levels and Flora: Submerged plants and algae take oxygen out of the water at night. Their effect can be significant when you have “green water” or light brownish water (phytoplankton algae and zooplankton). Water will naturally always jump into the shape of a sphere or drop, which means volume is at a maximum and surface area at a minimum. If any surface of water gets into contact with ambient air, aeration takes place ue to osmosis. The energy requirement for this process is negligible. However, the relative penetration rate of oxygen into a body of water, be it a lake or a drop, is also insignificant. If oxygen demand in a body of water is high, its surface layer, which is in contact with air, will be at a higher oxygen level than the rest. In order for that body of water to efficiently gain a greater oxygen level throughout, there has to be some sort of mechanical means of exchange. Solutions for this can and should be approached as if they were mole hills yet mountains of energy are wasted in today’s aeration technologies.